What an incredible experience to hang with 300+ MINIs and to be able to drive on the famed Indianapolis Motor Speedway. A dozen Chicago area motorists met up, and took a day trip down to Indy to join up with the MINI Takes the States cross country tour. Here are a couple of ideas for fun MINI things to do in the midwest area..
High Speed Auto-X Saturday August 26th: Participate, or head out to Blackhawk Racetrack to watch the action. 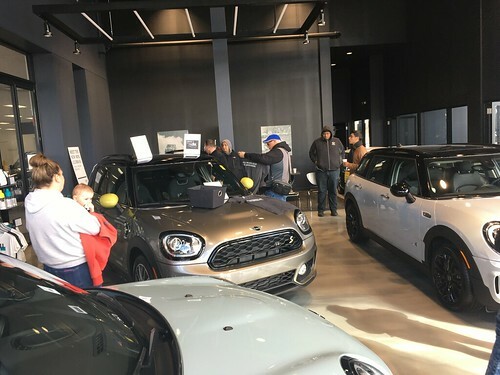 The the Midwestern Council Sports Car Clubs (MCSCC) has extended an offer of a free guest pass entry to Chicago MINI Motoring Club membership card holders. Geneva Concours d-Elegance Sunday August 27th: Check out the car show. Maseratti is the featured marque. MINI Takes the States Wednesday August 30th: Head down to Indianapolis in a MINI caravan to meet up with the Cross Country MINI celebration. Take a lap on the Speedway and tour the Museum with hundreds of other MINI fanatics. British Car Show Sunday September 10th: Palos Heights is again hosting one of the areas largest British Car shows. There will be a sharp looking Triumph TR-6 from one CMMC member present. Fall Folliage Scavenger hunt and drive September 17th: Join the Milwaukee MINI club on a scenic drive through the upper Kettle Moraine area. MINIs Great Lakes Crossing September 29th – October 1st: Take the special MINI and Mini only ferry across Lake Michigan and loop the Upper Peninsula, or join up in Milwaukee for part of the drive. Steve from the Midwestern Council Sports Car Clubs (MCSCC) has invited members of our club to participate in their Time Attack/ Autocross at Blackhawk Racetrack on Saturday August 26th. The MCSCC has also extended a special offer to CMMC members, allowing us a FREE guest pass entry to watch the event by flashing your Membership card. This is a $10 savings from a normal admission pass. If you are missing your membership card and would like to watch, send an e-mail to steve@chicagominiclub.com. some basis for $3.00 per person. Plan to join us from 2:00 PM to 6:00 PM for an afternoon of speed and excitement. *The Speedway is located at 4790 West 16th Street on the west side of Indianapolis; just minutes from Indianapolis Airport. Take I-465; Exit 16A, Crawford Rd. head east approximately 1.5 miles; the Speedway is located on the north east corner of Crawford and Georgetown roads. Use Main Gate #2 to enter the speedway. Speedway staff will direct you to the RV parking lot to register for the track lap. MINIUSA will be organizing a Cross Country Drive called MINI Takes the States (MTTS) to celebrate the arrival of the JCW Cooper S GP kit. Patrick MINI, in conjunction with Chicago MINI Motoring Club – will be conducting a drive from South Holland Oasis near the Illinois-Indiana border and join the celebration in Indianapolis. WHEN: Wednesday August 30th. We will hit the road at 9:30 am (Chicago time), and plan to get to Indy before 2pm (we will be going non-stop). WHO: Anyone can join in, but you must already be registered to participate in the festivities. Make check’s payable to: Children’s Memorial Foundation – Duke’s Fund (or put somewhere on the check that it is to be applied to Duke’s Fund). Check out This Post for additional information. Here is the Chicago forum information for people driving the leg from St. Louis to Indy. Here is a bit of news from Craven Speed that I am passing along for their Short Shifter kit..